What Rights Did Situ and Gyaltsab Rinpoches Have Over Rumtek? To answer this question, it is necessary to understand something about the legal structure of Tibetan monastic administrations. Traditionally, each high lama has his or her own labrang , or administration, to govern the monasteries and other properties under his control. The Karmapas have had their own labrang which has always been separate from the labrangs of other high lamas. Situ Rinpoche led the Palpung Labrang while Gyaltsab led his own Chogong Labrang, named respectively after each rinpoche’s traditional monastic seat. Under the Tibetan system, lamas from one labrang had no administrative authority in another administration. Thus, the two rinpoches, Situ and Gyaltsab, would never have been able to legally gain control of Rumtek Monastery, which was part of the Karmapa Labrang rather than part of either of their own administrations. So the only way open to lamas to take property from an outside labrang would be, simply put, to conduct a kind of coup d’état there. They found a powerful ally in the Sikkim state government of NB Bhandari. Why Did the Sikkim State Government Assist the Rumtek Take-over? We believe that Situ and Gyaltsab Rinpoches secured the assistance of Chief Minister Bhandari’s government by making two large contributions to his party totaling $2.5 million. We believe that an initial payment of $1 million was made to Bhandari before his police went into Rumtek. While we lack direct evidence, the indirect evidence for a large advance payment seems very strong. The Indian Constitution established India as a secular state and prohibits government officials from interfering in religious affairs. So, we have to wonder, why would Bhandari violate the Constitution and assist Situ Rinpoche’s group in seizing Rumtek? We can come up with no other explanation than that Situ Rinpoche bribed Bhandari to do this. However, we do have direct evidence that another payment was made by Situ Rinpoche’s group to Chief Minister Bhandari after Rumtek was seized by Situ Rinpoche’s group in 1993. This payment was delivered by the Taiwanese millionaire Chen Lu An, a follower of Situ Rinpoche. The payment was for $1.5 million. This donation has been documented by newspapers and government investigators in both Gangtok and New Delhi . The ensuing scandal led to investigations by the New Delhi government against Bhandari that helped bring about Bhandari’s ouster in 1995. How Could a Whole State Government Be Bought? It is an understatement, as Terhune says, to call Chief Minister Bhandari “a controversial figure.” History shows that the Sikkim government during the Bhandari years, from 1979-1995, was perhaps the most corrupt in India . Through a combination of payoffs and intimidation, the chief minister ran Sikkim as his own private fiefdom. Throughout Sikkim , stories of those bold enough to risk Bhandari’s wrath during this period abound. First, there was the opposition leader, Madan Tamang, who dared to circulate pamphlets accusing Bhandari of corruption and womanizing. In response, Mandan was arrested and died in custody. His body was later found in bushes alongside the Rongpo River . Shortly after this, a reporter in Siliguri, RK Baid, published a story detailing some recent examples of corruption in Bhandari’s administration. After this, Bhandari sent undercover police into the neighboring state of West Bengal —outside of their legal jurisdiction—to kidnap Baid and bring him to Gangtok. There he was held in prison and tortured. Afterwards, he was offered an amount of money said to be as high as five million rupees to sign a statement denying that he was kidnapped or mistreated. This reporter later opened a hotel in Siliguri using this hush money. Finally, Hamelal Bhandari (no relation to the chief minister), an attorney in Gangtok, took it upon himself to circulate posters again criticizing the chief minister’s actions. In responses, he was abducted by party bullies, taken to prison, tortured, and then thrown naked off a truck the next day onto the main street of Gangtok. He was lucky to escape with his life. Such was the atmosphere of open corruption and intimidation in the state in the eighties, that these heinous acts and many others were well known to the Sikkim public. Yet, all were afraid to take any action since they knew that the police were his personal enforcers and any action in the courts would be punished. Against this background the elections of 1989 took place. Bhandari’s systematic campaign of intimidation had so terrified the opposition that no other candidates stood against his party—something quite unusual in a democracy as lively as India ‘s. Sikkim is one of India ‘s smallest states, with a population of only 400,000, and the couple hundred opposition leaders who might have run for office were easy to intimidate. As a result, Bhandari’s party won all 32 seats in the Sikkim parliament, giving him a third term in office with unprecedented power over all branches of government, including of course, the judiciary. All of these events are a matter of public record in Sikkim. 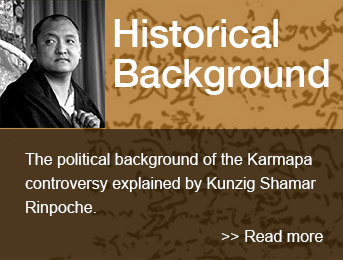 Why Didn’t the Karmapa Charitable Trust File Its Case Sooner? Though Situ and Gyaltsab Rinpoches’ group seized Rumtek with Chief Minister Bhandari’s help in 1993, the Karmapa Charitable Trust did not successfully file its first case against them until 1997, a full five years later. Why the delay? Even before Bhandari’s rule ended, there were those who were bold enough to file cases against his new friends Situ and Gyaltsab Rinpoches. Karma Gunbo, a former member of the Sikkim parliament and a devoted student of the late Sixteenth Karmapa, filed a case in Gangtok District Court in 1993 against Situ Rinpoche for forging his Karmapa-prediction letter. Once Chief Minister Bhandari was informed of this, he arrested Karma Gunbo’s family, including wife and children, and held them in prison for two weeks during which they were subjected to physical and psychological torture. Meanwhile, perhaps to ensure that they would not make trouble for Situ and Gyaltsab Rinpoches, Bhandari initiated an intimidation campaign against all the trustees of the Karmapa Charitable Trust. He expelled from Sikkim the two members who were not Indian citizens, Shamar Rinpoche and Topga Rinpoche. And against the two trustees who were residents of Sikkim , TS Gyaltsen and JD Densapa, both formerly high officials in the state government, Bhandari sent thugs to stone their houses and cars. Chief Minister Bhandari’s campaign of intimidation against the trustees was successful. JD Densapa in particular became so afraid to file a case in Gangtok that he attempted instead to file the case at the High Court in New Delhi in 1994 on behalf of the monastic community of Rumtek led by Ngedon Tenzin. The High Court responded that since this was a civil case, it should be submitted in the local state court, in Sikkim (the case was not in fact dismissed as Terhune stated in her book). Filing in Sikkim of course was out of the question while Chief Minister Bhandari remained in office. How Could a Case Be Filed in 1997? June 1992 was the beginning of the end for Bhandari. While Bhandari began interfering in Rumtek’s affairs, PK Chamling, one of Bhandari’s ministers, began to plan a campaign to replace the chief minister. He publicly accused Bhandari of corruption and began to refer to him as a “dictator.” In response, Bhandari arrested Chamling’s assistants and tortured them in prison. Fortunately, Chamling himself escaped and went into hiding. At this time, Shamar Rinpoche’s secretary, Khedrub Gyatso, met with Chamling to offer his support, presenting a loan to assist with Chamling’s election campaign, and requesting Chamling’s future assistance in regaining Rumtek for the Karmapa Charitable Trust. Chamling, however, had quite a different character than Bhandari. He responded that he was not in a position to remove Situ and Gyaltsab’s monks, but that he would guarantee that the Karmapa Charitable Trust would receive a fair hearing in the courts. Chamling began working with the New Delhi government to put pressure on Bhandari for his cooperation with the Taiwanese millionaire Chen Lu An and for shady dealings with the Chinese government. Pressure continued to mount and the central government asked more and more questions that Bhandari could not answer. By August 1995 things had gotten so bad for Bhandari that he was forced to resign in disgrace. This was an event of such import to the Karmapa controversy that devout Buddhists in Sikkim said at the time that Karmapa’s protectors must have inspired Chamling to conceive his coup. But still the Karmapa Charitable Trust could not file its case because its trustee JD Densapa was afraid that Bhandari’s party would return and exact revenge. Tired of waiting, in August of 1996, the legitimate monks of Rumtek held a hunger strike to call on the state government to restore them to their monastery. New Chief Minister Chamling invited 40 senior lamas to his residence for a conference. There he suggested that there was “no point in sleeping on the road” and continuing their protest. The government could not legally remove the monks of Situ and Gyaltsab Rinpoches from Rumtek. Instead, their only remedy was to request a court order to return them to their monastery.